Summary of Stall holder's Public & product Liability Insurance. Policy Wording of Stall holder's Public & product Liability Insurance. Sites cannot be pre-booked as of April 2019. You just turn up on the day between 6.00am and 8.00. The earlier you are the better site you will get. 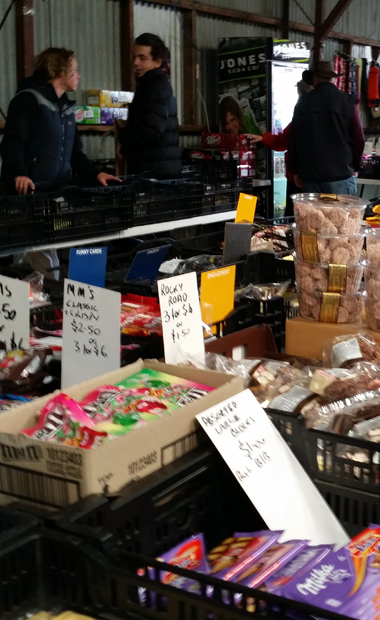 It is a requirement of the Ballarat Market’s (BM) insurer that all stallholders have public liability insurance. This requirement is common at most markets and is, in the BM's opinion, good business practice. All stallholders will now have some insurance protection if an incident occurs that is attributable to activities on their site(s). Many of the regular stall holders will already have this insurance and so there will not be an extra cost just some paperwork to complete. Last year is was floated that this was needed and a price of $6 per day pet site was floated for casual PL insurance. The BM has decided to cover some of the costs. The price for Public liability insurance will be $5 per site/day for casual site holders. For booked sites there are two options. Firstly, you can pay $5 per day /site as per a casual site booking or if you have or wish to get your own public liability insurance you need to supply a certificate of currency for public liability insurance to the BM. If this certificate is supplied, then a charge for PL insurance will not be levied and the coverage available through the BM insurers will not apply. It has taken a while to get the policies in place and the commencement date for all stallholders to have Public Liability Insurance is 1st April 2019(Delayed due to administrative issues from 01/03/2019). If a stall holder with a booked site has pre-existing public liability insurance, with the appropriate cover, the application form will need to be completed and a certificate of currency for the policy attached. Any stallholder who does not have a policy and wishes to get their own can find more information at www.stallinsure.com.au or at one of many other insurance providers. Food service, amusements and any other activity not coverable by the BM stallholder public liability policy. The PL coverage offered by the market does not apply to these types of activities. All food sellers, childrens rides and amusement and any other high risk activity as deemed by the BM must have their own public liabiity policy. The application form and other documents can be found here. Any questions? Phone or email us and we will be pleased to help. Gates are open at 6.00am. Entry is via the Creswick rd. / Howitt street entrance. All sites must be set up by 8.00am. Trading hours are on Sunday between 8am and 1pm. No exit from the market is permitted before 1pm. During operating hours of 8am to 1 pm no vehicular movements are permitted. For more details see the information sheet. There will be staff at the gate who will give you directions to what sites are available. Look for someone wearing a blue Rotary cap. There is no need to pay for the site at the gate. Site fees are collected by our collectors during the morning. Outside sites are usually available however the better positions are taken up quickly. if it looks like rain, so they are not guaranteed. The sites (inside and outside) are marked with a red tag if they are a booked site. If the site does not have a red tag it is available for casual occupancy so you simply occupy the unmarked site of your choice. The Rotary member will come around about 9.00am to collect the site fees. As of April 2019 all payments are cash only. Cheque or direct deposit by arrangement. You can bring a tent/gazebo etc. to give you shade or protection for outside sites. Some outside sites have access for power. All extension leads must be laid safely so as not to cause a hazard to foot or vehicular traffic and must be safety tagged. Trestle hire is arranged on site separate to our club. This service is provided in the main pavilion and outside. Click here for the market’s information sheet. 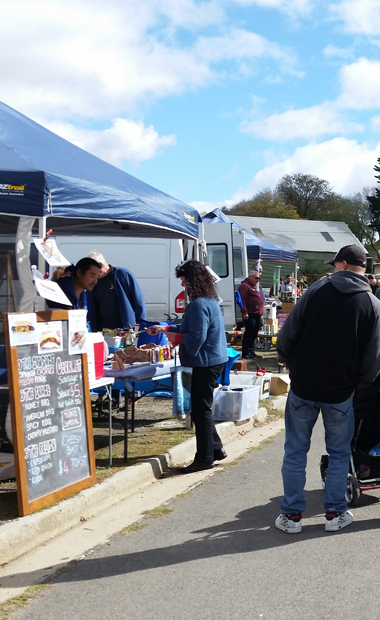 For further information about the market, please phone 0418 518 106 or email the market organisers.